I learned this definition as a young student and repeated it a thousand times over my 12 years of teaching elementary school and then middle school English. But just tonight it struck me that some nouns are all of these at once. Take this set of a table and chairs for instance. I write this post tonight, as I have written many others on a laptop perched on this table. It wasn’t until tonight though that I really allowed my mind and heart to wander down the rabbit hole of what it means to me. 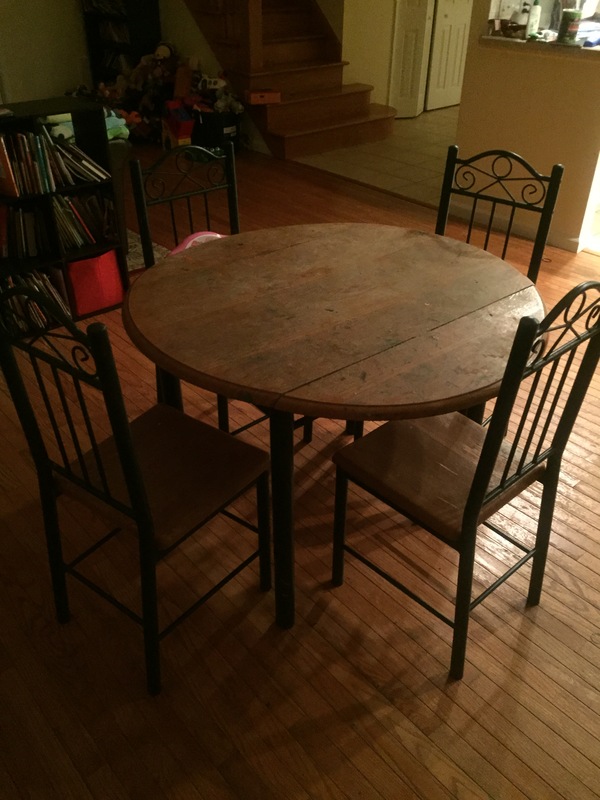 A table with four chairs. It was a cheap set from Wal-Mart, couldn’t have cost more than a hundred dollars. My father wanted to buy my fiance (now husband) and I a housewarming gift for our one bedroom apartment in Brooklyn. It is funny to me now that we ever folded down one of the leaves to fit it flush against the wall. Only two of us at the time, now there are 6! 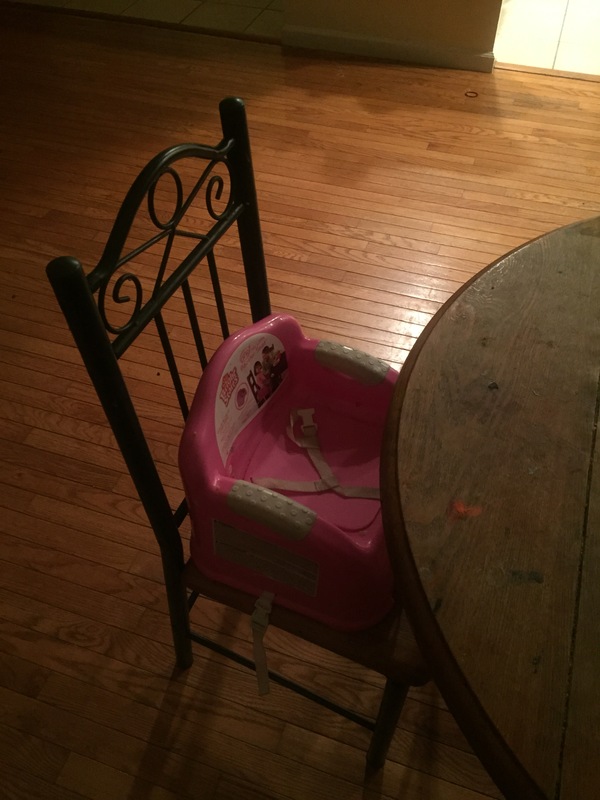 It fit in our apartment snugly and served us well when my parents came for dinner, but we continued to use it as our primary kitchen table even as our family outgrew the number of chairs. This table has lived in all 5 of our homes over the past 12 years. I bet when my father had the idea to purchase it; he had no idea how much of our lives it would see us through. He had no idea that it would out live him. He had no idea that one day his only granddaughter would sit at that table on a little piece of him that would have to suffice in place of his loving lap. We have eaten meals on this table, completed homework, exploded homemade volcanoes, cut numerous birthday cakes, colored, painted, laughed and cried. 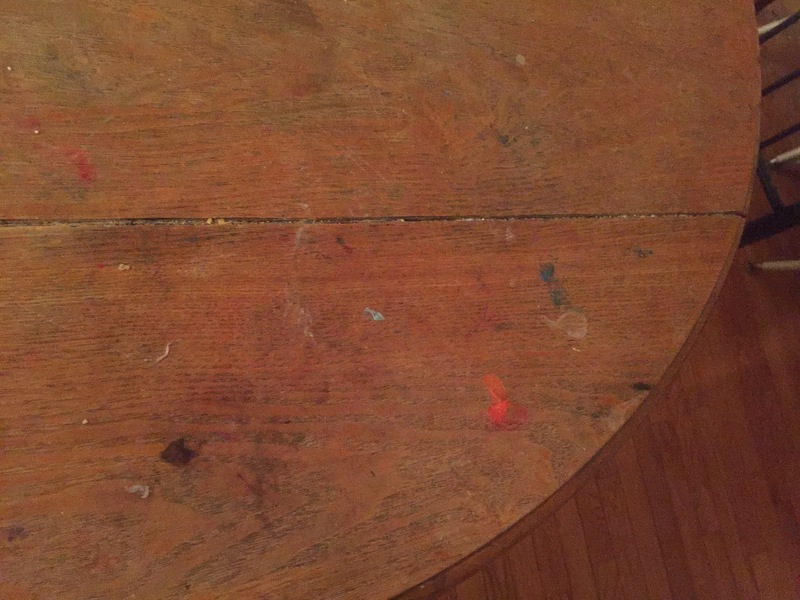 This table has dried playdough caked in the line where the leaves fold down…though now we never have a need to fold them down. This table wobbles and creaks, and screws, washers, and bizarre pieces of metal keep finding their way into my dustpan as I sweep up evidence of life from beneath it a hundred times a day. I say these things in my head. I muse about them aloud. But underneath the day-to-day routine, this table breaks my heart. I don’t think I can throw it away, even though I know I should. My father loved kitchens. He said that life happens in kitchens and that is where he wants to be.